Combining CO₂ storage with gas production greatly reduces the likelihood of soil movements and subsidence. It is very likely that nothing can be noticed at the surface. This follows from scientific research that Circular Energy has carried out for its clean power plant. Lidewij Schutte, master student Geology at Utrecht University, writes her graduation assignment about this at Circular Energy. Scientific research is necessary because CO₂ -injection into a full gas field up is relatively new. 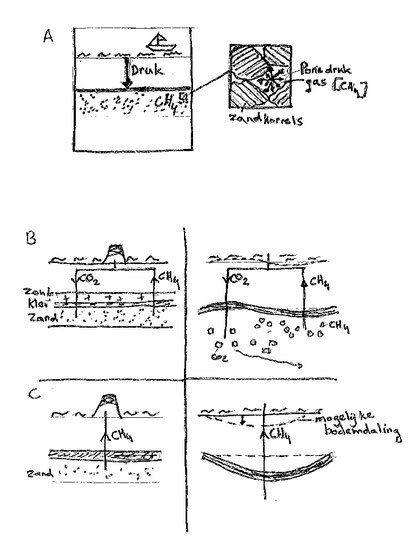 The experiences gained so far with CO₂ injection in Norway, Canada, USA and Japan relate to (almost) empty gas fields or water-bearing layers. Therefore, theoretical calculations and models from geology and geophysics were applied. How does it work geologically? The soil above a gas field exerts a vertical pressure of a few hundred bar on the caprock and the reservoir (overburden) (A). The pores between the grains of sand in the reservoir, in which the natural gas is trapped, exert counterpressure in all directions. These two types of pressure keep each other in balance. The pore pressure decreases due to gas production (C). Schutte explains: Because the overburden remains the same, the effective downward pressure increases. With risk of soil movements and soil subsidence at the surface as a result. These effects are not immediately noticeable because the pore pressure does not drop very fast and the soil is elastic to some extent. Once the elasticity has maxed out, however, it is irreversible: soil subsidence and movements cannot be undone and they can also continue for a long time, even after cessation of production. By injecting CO₂ in the same field from the very start of the natural gas production, these consequences can largely be prevented (B). The CO₂ maintains the pore pressure. As a result, the effective pressure on the caprock is considerably lower and therefore the likelihood of subsidence and earthquakes is also greatly reduced. In other words, the soil remains much more stable.